The refrain echoes in my ears, the challenge resonates somewhere deeper. I am no good at being still. I am good at working, good at running, good at fighting, good at doing all the things. Even when I can manage to still my body, my mind is another matter. All the things beg for my attention. All the causes, all the stories, all the problems begging to be solved with just a little more ingenuity and grit. I can do this, I say aloud in the car. And then a little one appears on my doorstep in need of all the things. Tracking down the paperwork is a chore. Getting all the signatures requires an act of congress. End of quarter assessments loom large as unexpected leave days drag on. I know that he is God. In a brain-knowing sort of way. Until Jesus shows up on my doorstep. With clothes and toys and food. So much food. With plumbing skills and parenting advice. With quality time and words of affirmation. And (did I mention) food. Sometimes Jesus shows up on your doorstep. All the battles are not yours to fight. All the things are not yours to do. The verse flashes up on the screen. I’ve heard it, read it, spoken it a thousand times before. Today there is something new. Don’t be anxious. Pray. Give thanks. Tell God what you need. I’ve always thought of this guarding as sort of passive. I give my anxieties to Jesus and he puts up a little gate (maybe a hedge?) of peace. Today the word guard rushes in my ears. I bust out my Hebrew-Greek key word Bible and read that this guard is not a gate. A faithful soldier standing in front of the gate. Ready to beat the crap out of anybody that tries to intrude. A warrior mama standing guard over her babies. Daring someone to cross that threshold. Usually I don’t go much for military metaphors. But this one has me. The truth, friends, is that I need that peace. Not passive gate kind of peace. Faithful soldier, warrior mama kind of peace. All up in my heart. Because a gate isn’t going to stop my anxieties. That’s the Jesus I need today. This is my word for this year, I think. The times in my life when I’ve felt happiest and most fulfilled have been the margin times. Times with a little space, a little breathing room. Enough blank boxes on the calendar. Enough unscheduled moments in the day. Enough unallotted money in the budget. Enough space in the car, in the closet, in our hearts. To enjoy what we have. To take the scenic detour. 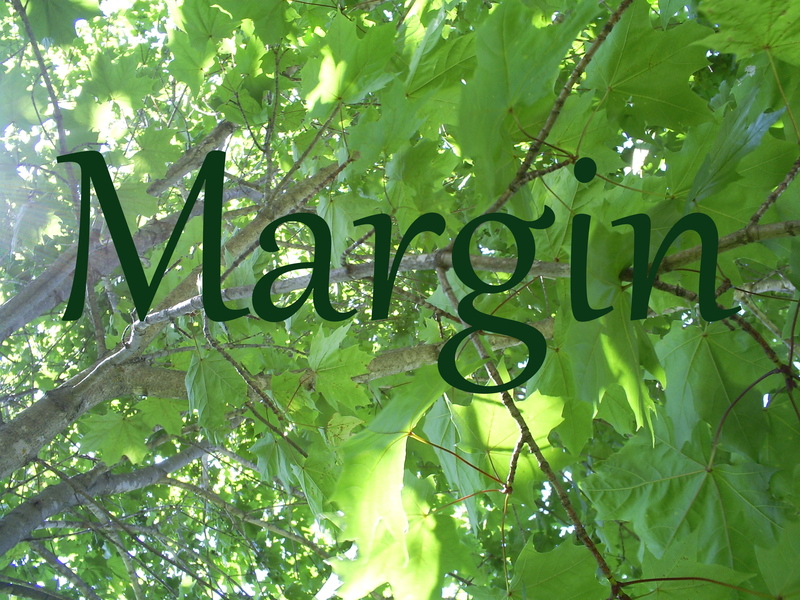 Margin means saying no to the tyranny of the urgent. Abandoning the quest to keep up with the Joneses. Being brave enough to disappoint. Margin means making space for what matters. And an incredible little girl who calls me mom.